The world of bugs normally passes beneath our notice, yet shrink yourself to their size, see them in 3D and you’ll enter a world you’d never believe existed. Big Bugs in 3D uses specially developed 3D technology to take the viewer on a global journey, from Mexico and the rainforests of Asia to our own backyards. There are perhaps four and a half million different kinds of bugs sharing the planet with us. They exist in a bewildering variety of forms, some more like creatures from an alien world. Big Bugs asks how and why these creatures have become so successful. One factor linking all bugs is their exo-skeleton – a tough suit of armour covering all their soft parts. Made of a substance called chitin, it can be moulded into an infinite variety of shapes. It can turn jaws into lethal weapons or be shaped into delicate wings. Yet even delicate wings are surprisingly tough. Big Bugs follows the incredible journey of the monarch butterfly, from its wintering grounds in the mountains of Central Mexico, where tens of millions crowd the air, right up into southern Canada. Those that reach Canada are the great great great grandchildren of those that left Mexico, yet the last generation to emerge will themselves make the whole of the return journey, perhaps 4000 kilometres. How they find one tiny patch of hillside in Mexico, a place they have never seen, is one of the great mysteries of the insect world. Tropical rainforests hide butterflies of extraordinary beauty and Big Bugs features an aerial ballet, shot in stunning 3D slow motion, of some of the most spectacular. But the world of Big Bugs is inhabited by both beauty and the beast. Below the dancing butterflies an ordinary-looking patch of forest floor suddenly lifts up to reveal a trap door spider, which lunges out of its hidden lair to seize a passing cricket. A sandy patch of ground is pock-marked by a moonscape of craters – the pitfall traps of ant-lion larvae. The sides of these craters are so unstable, a small insect will lose its footing and slide to the bottom of the pit – and into the huge jaws of the ant-lion, hidden at the bottom of the pit. There are plenty of bugs in our gardens and homes. We visit the violent world of a flower bed, to see lacewings and ladybirds wreaking havoc on herds of aphids. And we see what our kitchens look like to roaches and flies. Yet to many creatures, bugs are just bite-sized packets of protein – a fact made clear as we watch spectacular 3D slow motion footage of birds catching bugs in flight, arowana fish leaping 2 metres from the Amazon to engulf insects on overhanging branches and archer fish shooting down insects with precisely aimed drops of water. Yet often the most gruesome killers of bugs are other bugs. 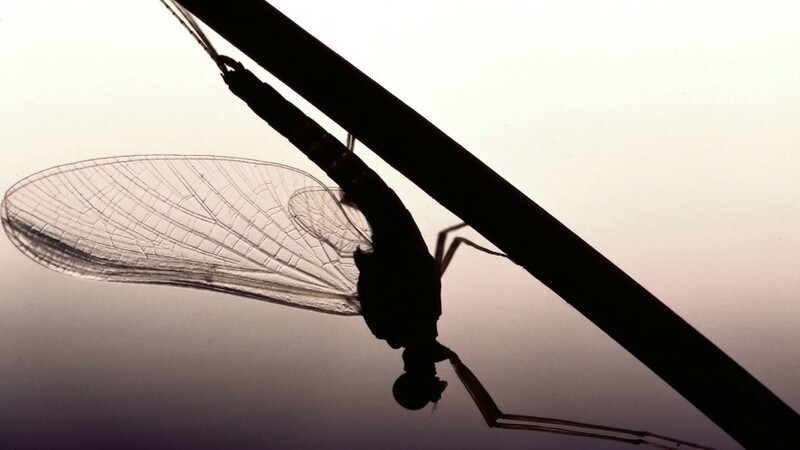 We dip beneath the surface of an ordinary pond to discover a hunting dragonfly larva. That ever-adaptable exo-skeleton has allowed the dragonfly to evolve a lower jaw that works like an extendable gin-trap. It can shoot out nearly half the larva’s body length to spring closed on a passing bug. This might seem like an alien world, yet without the world of bugs, we wouldn’t last more than a few months. They pollinate our crops and clear away waste. Without them we would quickly starve or drown in our own waste. But after Big Bugs in 3D, you’ll never look at bugs in the same way again.